Receipts were 1764, including 253 packer cows, bred cows and pairs, 1511 yearlings and calves. Packer cows were steady to $2 lower. Packer bulls were steady to $2 higher. Market on replacement cows and pairs were steady to last week’s high market. Market on steers and heifers weighing 500# and under were steady with a very good demand. Feeder steers and heifers weighing over 500# were steady to $2 lower with bidding being very active. We had a good run of cattle today with the market staying steady. Receipts were 1621, including 279 packer cows, bred cows and pairs, 1342 yearlings and calves. Packer cows were $2 to $4 higher. Packer bulls were $1 to $3 higher. Market on replacement cows and pairs were $150 to $200 higher on the younger and better kind. Market on steers and heifers weighing 500# and under were steady to $2 higher on the better quality calves. Feeder steers and heifers weighing over 500# were steady but $5 to $8 lower on the fleshy bulls and heifers. The market was softer today on the 500-600# bulls and heifers. Receipts were 1434, including 195 packer cows, bred cows and pairs, 1239 yearlings and calves. Packer cows were steady to $2 higher. Packer bulls were steady to $3 higher. Market on replacement cows and pairs were steady to last week’s high market but with a very good demand. Market on steers and heifers weighing 500# and under were steady on the better kind with the plainer calves being $5 to $10 lower. Feeder steers and heifers weighing over 500# were steady on the better kind and $4 to $8 lower on the fat steers and bulls. The market was cheaper today due to the board being down the limit last week. Receipts were 1565, including 288 packer cows, bred cows and pairs, 1277 yearlings and calves. Packer cows were $1 to $3 higher. Packer bulls were steady to $2 higher. Market on replacement cows and pairs were $100 to $200 higher. Market on steers and heifers weighing 500# and under were $2 to $4 higher. Feeder steers and heifers weighing over 500# were $2 to $4 lower. 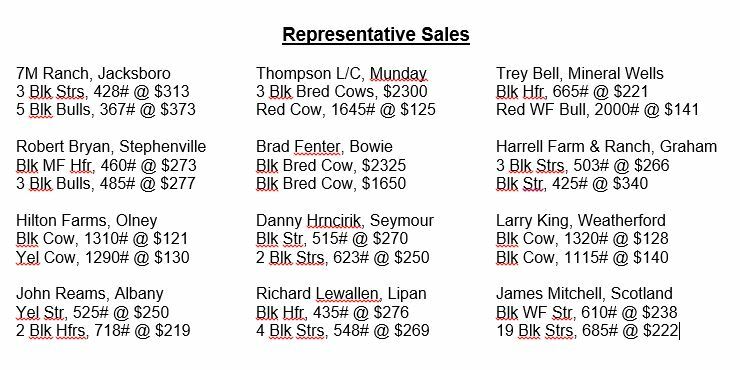 The market was strong on the light calves but lower on the feeder cattle due to the board being down for the last four days.